Indicated in the treatment of asthma. May increase penile rigidity and average duration of erections. Forskolin is an extract of the ayurvedic herb Coleus forskohlii. It re-sensitises cell receptors by activating the enzyme adenylate cyclase and by increasing the amount of cyclic AMP (adenosine monophosphate) in cells. Cyclic AMP is a signal-carrier which is essential if cells are to react correctly to hormonal stimulation. Cyclic AMP is necessary for intracellular transmission in the hypothalamo-pituitary axis and for feedback control in hormone production. Restoring sensitivity of the hypothalamus and peripheral receptors enables hormones and other bio-energetic factors to work more effectively. It is not enough to simply restore correct hormone levels within the body - hormonal receptors also need to be sensitive and react effectively to stimuli. Forskolin also lowers intra-ocular blood pressure: a number of studies have shown it to be effective in treating glaucoma. Other benefits have been reported in the treatment of hypertension, asthma, eczema, psoriasis and angina pectoris. Forskolin stimulates digestive enzymes and improves nutrient absorption in the small intestine. Recent studies also show it stimulates thyroid function, increases basal metabolism, produces a significant rise in lipolysis (unsurprising, given that this is regulated by cyclic AMP) and even lowers fatty tissue synthesis. As a result, forskolin has become one of the most popular fat-burners' since ephedra was withdrawn from the market. 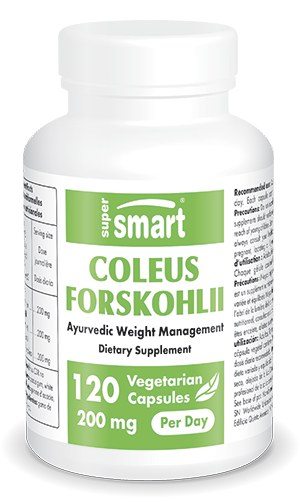 Each vegetarian capsule contains 100mg Coleus forskohlii extract standardised to provide 10% forskolin.